Chicken breasts are marinated in a spicy and sweet paste full of Thai flavor. 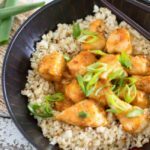 Serve these spicy Thai chicken skewers over fried cauliflower rice for the perfect healthy, but flavorful dinner! Hello everyone! Did you have a nice weekend? Who saw Beauty and the Beast? I saw it and loved it so much that I want to go see it again. ? Other than that, the rest of weekend was pretty uneventful around here. Yesterday was the first day of spring! The weather was pretty decent.. lots of sunshine and temps in the 50s. Let’s hope we are on the upswing for warm weather now! 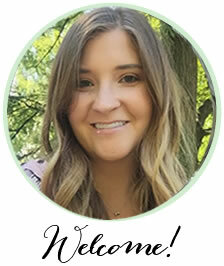 Now, let’s jump into today’s recipe… it’s a good one and I’m super excited about it! Obviously, all of the recipes I share are good ones. I wouldn’t share them if they weren’t good! Buuut, some are just really good and get me excited. ? Once spring arrives, I start wanting grilled food and lots of veggies. 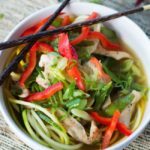 Light and healthy meals always taste better when the weather is warm. Am I right, or am I right? ? This recipe may sound complicated, but it couldn’t be any easier. 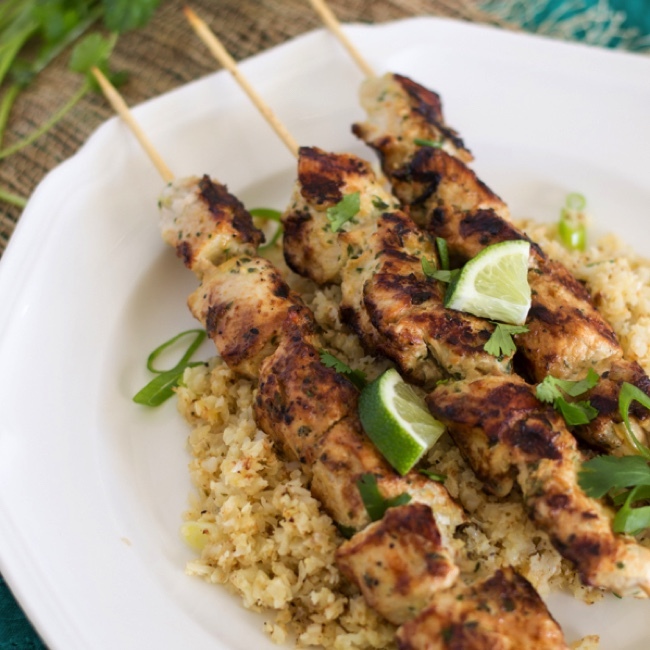 You combine a ton of flavorful ingredients to marinate the chicken, skewer it up, grill it, and serve with an easy fried cauliflower rice. Yum! 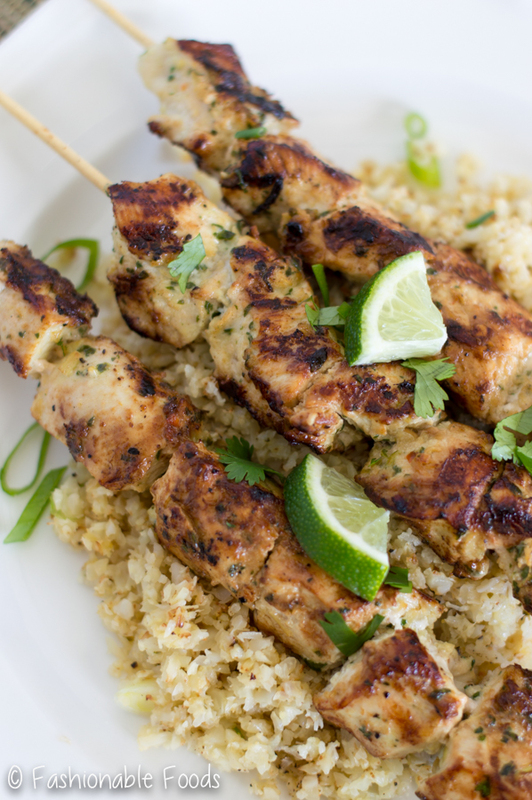 Did I mention these tasty spicy Thai chicken skewers are healthy? Not only are they gluten-free and dairy-free, but they are Paleo and Whole30 compliant, too! That means, no added sugar since we are sweetening naturally. Win! To make the marinade, grab a mini food processor and toss in a thai chili, lime, garlic, ginger, lemongrass, cilantro, fish sauce, and fresh pineapple. Give it a whirl until you have a wet paste. You’re going to reserve two tablespoons to use in the fried cauliflower rice, so don’t forget! Marinate the chicken for at least 30 minutes, but up to 12 hours. Skewer the chicken cubes and then cook! I made my mine indoors on a grill pan (still too cool for me to grill), but you can definitely do them outside. Just be sure and keep the heat low so that the chicken cooks through but the outside doesn’t burn. While your chicken is marinating, you can work on the cauliflower. I love using cauliflower “rice”. My new favorite way of preparing it is to roast cauliflower florets until very crisp-tender. Then, take it to the food processor to get it to resemble rice. I love this method because it dries the cauliflower out (so that it’s not too wet), plus adds a ton more flavor. Then, I just “fry” the rice in a skillet with some coconut oil and toss in the reserved marinade. I meant to add a scrambled egg in there, but totally forgot. It was just fine without it, so I left it out of the recipe. However, I’m sure it would be tasty with that egg mixed in! If you don’t feel like making your own cauliflower rice, you can definitely use already riced cauliflower from the freezer section, or even the produce section. I’ve seen it available in a lot of grocery stores! 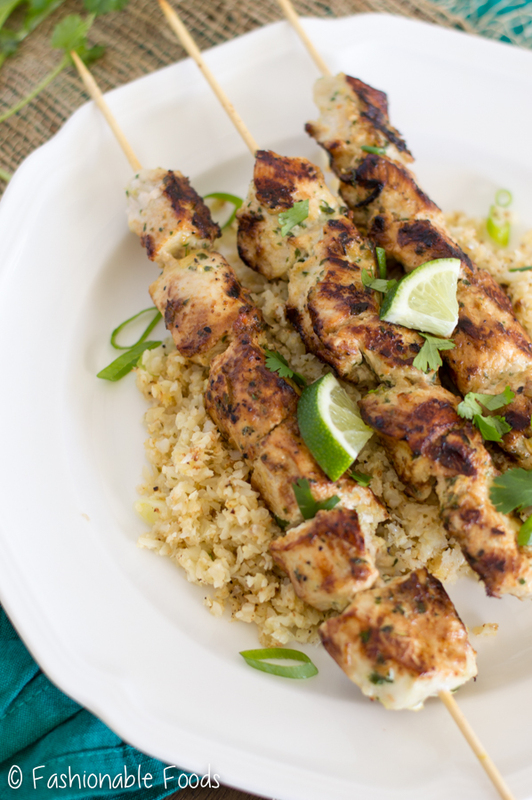 Get your grill on ASAP… indoors or out with these thai chicken skewers! You won’t be sorry. Eating healthy never tasted so good! Place the dried pepper in a small bowl and cover with very hot water for 2-3 minutes, or until just starting to soften. In the bowl of a small food processor, add the pepper, lime juice, garlic, ginger, lemongrass, cilantro, fish sauce, and pineapple. Pulse a bunch of times until all the ingredients are well chopped up and you have a wet paste. Reserve 2 tablespoons of the marinade for the cauliflower rice. In a bowl, toss the chicken cubes with the remainder of the marinade and season well with salt and pepper. Allow the chicken to marinate at room temperature for 30 minutes, or in the refrigerator for up to 12 hours. On a baking sheet, toss the cauliflower florets with the olive oil and season well with salt and pepper. Roast in the oven for about 15 minutes, or until the cauliflower is crisp tender. You don’t want it cooked all the way through. Place the cauliflower in the bowl of a food processor and pulse until you have rice. Set aside. 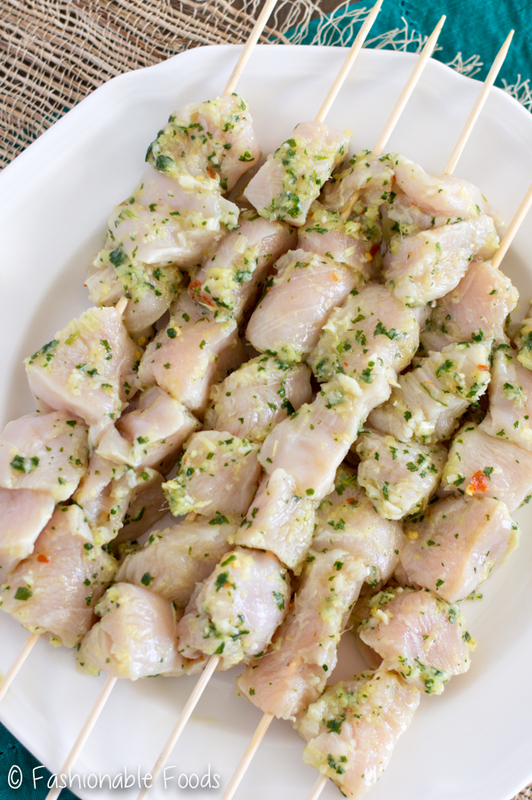 Thread the chicken pieces onto the skewers, about 4-5 pieces on each. Preheat a grill pan or large skillet (or outdoor grill). Melt the coconut oil in the pan and add the skewers. Cook until golden on all sides and the chicken is cooked through, about 10-15 minutes, lowering the heat as you cook so the outside doesn’t burn. In a skillet, melt the other tablespoon of coconut oil and when the pan is really hot, add in the cauliflower rice. Cook for about a minute or two, and then add in the reserved marinade and stir until combined. 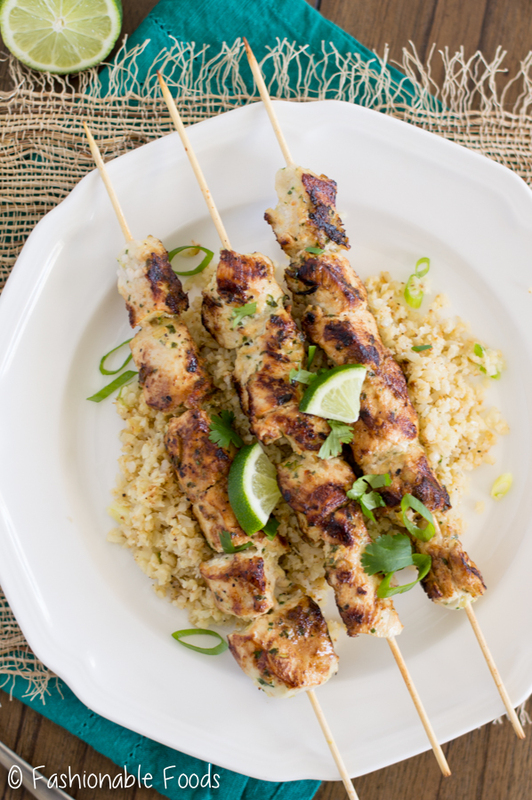 Serve the skewers over the cauliflower rice. Thanks, Mary! Cauliflower fried rice has been on repeat for me lately, I’m so obsessed! Stay warm ? Oh! Thanks for the movie review. I am planning to watch ‘Beauty and the Beast’ movie this weekend. And yeah for Spring. Sadly we are still dealing with winter in this part of the world. I am so much in love with these spicy chicken skewers. Pairing them with cauliflower rice sounds like a wonderful idea. Thanks, Anu! I hope winter moves on ASAP! I haven’t seen Beauty and the Beast yet, but I’ve heard it’s so good! It’s definitely on my list to see. And yay for spring! It’s going to be around 70 here tomorrow, and I can’t wait. 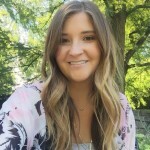 These chicken skewers look so perfect to break in the season, Keri! I’m love the thai flavor. Just what I need for dinner! It is really good! I really do want to go see it again haha. 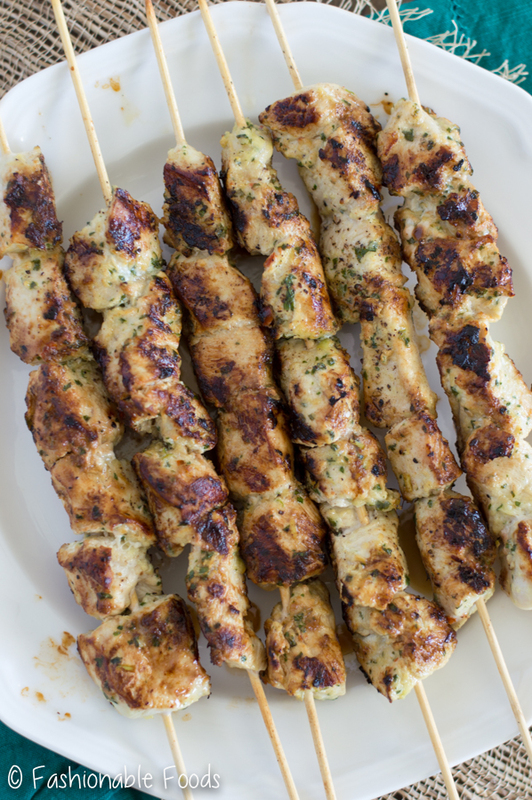 Enjoy the warm weather, Gayle and thanks for the kind words on the chicken skewers! I haven’t seen Beauty and the Beast YET. I’m totally planning on watching it, but I’m waiting to stream it since I’m allergic to the move theater. 🙂 Once spring hits I definitely crave light and healthy meals. And grilling is a MUST. 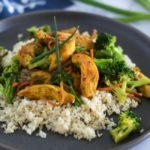 I’m obsessed with all things spicy Thai flavored, and I absolutely love me some cauliflower rice, so I feel like you made this meal just for ME! SO YUM! Pinned! Cheers, friend! This really sounds like a nice meal. 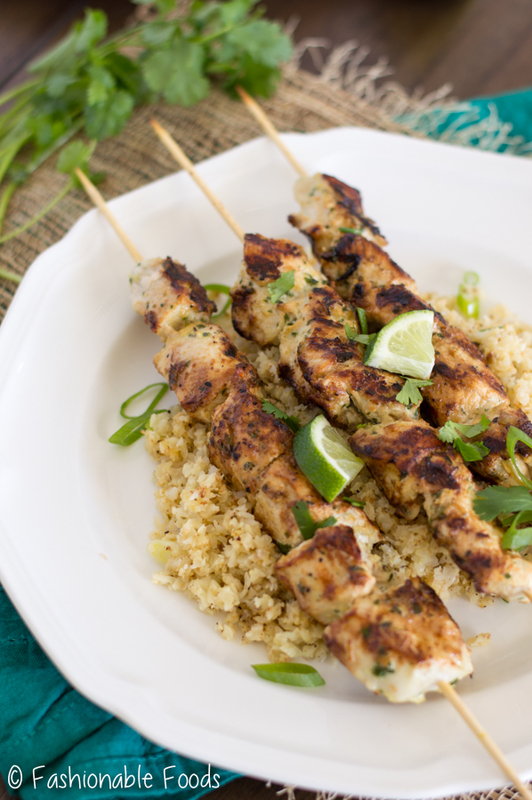 I like that you added pineapple to your marinade…it must have added lots of flavor to the dish.